In this very first podcast of South London Voices, local author, Stevie Henden, tells us about his family’s connection to South London over a number of generations and his fascination with flying bombs and spiritual fantasy. 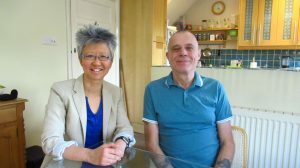 Stevie Henden talks with host Yang-May Ooi about his family’s multi-generational connection to South London and his London-inspired “spiritual fantasy” novels. Stevie also shares with us his fascination with the architecture and buildings of South London – and how World War Two and the Blitz impacted on the area. Join us to listen to this intriguing conversation with our very first South London Voice.